The Giants are looking to come back from a disastrous season and bring a NFC East and Super Bowl title back to New York. With a revamped team on both sides of the ball, led by a high octane offense, the Giants are ready make an impact in the NFC. Division rivals, the Dallas Cowboys and the Philadelphia Eagles are ready to halt the Giants in their tracks. Grab your NY Giants tickets and head down to MetLife Stadium to be a part of the home field advantage. The New York Giants looked promising 2017 after making the playoffs in 2016. They started the season 0-5 and only got worse. They ended the season 3-13, the worst record in the history of the franchise. But with healthy players and a fresh start, the New York Giants can make an impact this season. The four time Super Bowl champions will be out to claim their throne and you can watch them live by booking your New York Giants tickets. The New York Giants have been a force to be reckoned with for the most part and as a result have delivered some epic performances over the years. The First Super Bowl Triumph - The New York Giants had won four NFL titles before they hadn’t even come close to getting their hands on the Super Bowl post the NFL/AFL merger. The Giants decided to do something about it and reached NFL’s showpiece game for the first time in the 1986 season. On January 25, 1987, they took on the Denver Broncos at the iconic Rose Bowl. The Giants ended the jinx to win the game 39-20. The Move That Changed Everything - The New York Giants signed Lawrence Taylor in the 1981 NFL Draft and that move changed everything for the Giants. Taylor was a force of nature. He stayed with the Giants for thirteen years and during that time won two Super Bowls and became a ten time Pro Bowl pick. Taylor’s influence however went beyond everything he did for the Giants. Many people think it was Taylor’s style of play that eventually led to how offenses prepare and play these days. The Mother of all Upsets - The New York Giants pulled off one of the most miraculous triumphs by winning Super Bowl XLII. That win is regarded by almost everyone as one of the greatest upsets in sports history. The Giants had finished second in the NFC East and went 4-4 over their last eight games to finish the season 10-6. That was just about good enough to push them over the line and into the playoffs. They beat the Bucs, the Cowboys and the Packers in the postseason to set up a meeting with the 18-0 Patriots in Super Bowl XLII at the University of Phoenix Stadium. The Patriots were overwhelming favorites but the Giants had other ideas. Eli Manning was the star of the show as he delivered a vintage performance and the Giants won 17-14. It was a stunning upset pulled off by a stunning football team. The New York Giants have fierce rivalries with the likes of Philadelphia Eagles, Dallas Cowboys and the Washington Redskins. The Giants-Eagles Rivalry- Without a doubt one of the fiercest rivalries in North American professional sports is the one between the New York Giants and the Philadelphia Eagles. These two sides first met on October 15, 1933, and it has just carried on from there. These two sides have been members of the same division since the year 1933 and then there is a small issue of New York and Philadelphia having a rivalry based on their geographical locations. Giants-Cowboys Rivalry - The rivalry between the New York Giants and the Dallas Cowboys is a fierce one. They met for the first time on the football pitch on December 4, 1960, in a game that ended in a 31-31 tie. This game set the tone for what has now become one of the most talked about rivalries in the NFL. Giants-Redskins Rivalry - The New York Giants and the Washington Redskins rivalry kicked off in 1932 when the latter was formed. It is also NFC East Division’s oldest rivalry. The animosity between the two teams reached its height in the 1980s when the Giants and the Redskins began to fight for division championships and of course Super Bowl titles. That resulted in these two famous teams accounting for five Super Bowls and seven division championships between them during that era. Shared with cross-town rivals the New York Jets, MetLife Stadium is the only NFL venue to be home to two franchises. This 83,000 seat venue is located at the Meadowlands Sports Complex in East Rutherford, New Jersey. The stadium features a very unique experience with it's "Coaches Club," where fans can visit a private, on-field deck just five yards behind the home team's bench. The MetLife Stadium holds the record of being the most expensive stadium in history. It also has the distinction of hosting the first Super Bowl to be played in the New York metropolitan area. The Seahawks beat the Broncos 43-8 in 2014 to lift Super Bowl XLVII. The stadium also hosted WrestleMania XXIX and also provided the stage for artists like Bon Jovi, Eagles, U2, Bruce Springsteen and Kenny Chesney to perform for their fans. The New York Giants have won four NFL titles, four Super Bowls, eleven conference championships and sixteen division crowns. They have won all due to the legends that have played for them. Lawrence Taylor is one of the greatest players to have laced up a pair of football boots. He won two Super Bowl titles, was a ten time Pro Bowl pick and an NFL MVP. The Giants have retired his number 56. Michael Strahan won one Super Bowl with the Giants and earned seven Pro Bowl selections too. Then there is Eli Manning who is still playing for them. He has won two Super Bowls with the Giants and was the MVP on both occasions. On top of that, he has also earned four Pro Bowl selections. The New York Giants will be out to prove the naysayers wrong this season. They will need the support of their fans in their quest to reach the top of the ladder once again, especially at home at the MetLife Stadium. The schedule for the season is out and New York Giants tickets 2018 are in demand. Giants fans look as ready as their team and it promises to be a ride that will be nothing short of fascinating. Our process for purchasing cheap New York Giants tickets is simple and fast. There are so many online ticketing sites, that it can be hard for customers to find the right place to buy New York Giants tickets at the cheapest price. At ScoreBig we think of our customers first and foremost. We offer daily deals for New York Giants events, so our customers can get the best seats for the best prices. ScoreBig will always go above and beyond to offer the cheapest New York Giants tickets on the market. The New York Giants schedule above, displays all available events for 2019 and 2020. Once you find the event that you would like to go to, click the red “Get Tickets” button. It is located on the right-hand side of the event listing, it will take you to an New York Giants event ticket page. ScoreBig's event ticket page will display all available New York Giants tickets for that event. On the event ticket page to help with your search for the right New York Giants tickets, use the filters at the top to select quantity, price range, and more. There is also an interactive seating chart so you can pick where you want to sit. When you are ready to buy a ticket, click on the listing, and you will be directed to ScoreBig's checkout page. Upon completion of the information fields, your order will be processed and your New York Giants tickets will be delivered via email, mail, or to your mobile device. What makes ScoreBig’s site stand out from the rest? We are constantly analyzing our competitors to improve our site, service, and prices. ScoreBig.com employees strive to offer the best process and experience to buy cheap New York Giants tickets. Our goal is to get you the best seats to New York Giants events. We offer daily discounts on our site and for special promotions check out our newsletter. If there are no New York Giants events currently available, you can use our search feature at the top of the page to see a list of all popular events going on near you. No matter your price point, we have all the best deals and discounts on New York Giants tickets. For more information on prices of New York Giants tickets and the schedule for New York Giants, check out our listings above. The last thing you want to find out is when the New York Giants event you wanted to go to is sold-out. Don’t worry in many cases ScoreBig has affordable tickets to sold out events. We sell tickets from GA all the way to premium seating and parking. Skip the scalpers in the parking lot and get your tickets online from top New York Giants ticket brokers. We get you in all events, buy your New York Giants tickets here from a brand that many trust and rely on for all their ticketing needs. ScoreBig offers a 100% money-back guarantee. If you have been in search of cheap tickets for New York Giants, ScoreBig by far is the best option. That’s why ScoreBig has more loyal customers than any other ticketing site. 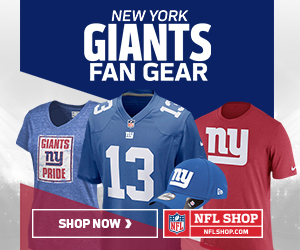 Shop at ScoreBig for safe and secure New York Giants event tickets.